Technically we arrived in Fiji a day later than planned after our Fiji Airways flight was delayed five hours due to ‘operational reasons’ – which translated to the fact they’d held the inbound flight to Vanuatu by five hours to accommodate a late aircraft from the US. 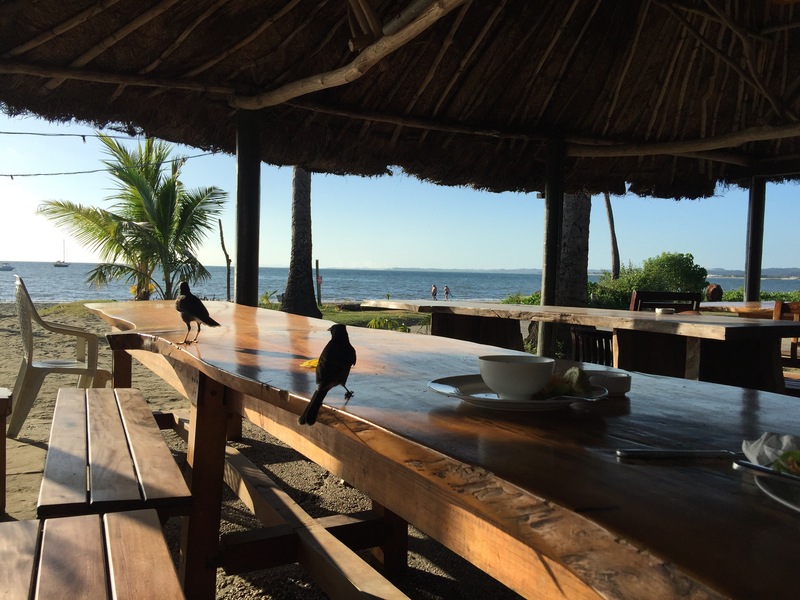 Uncomfortable chairs, no information and a £5 food voucher meant my already dim view of Fiji Airways was fast getting worse and rolling into our hostel, the Bamboo Backpackers in Nadi at 2am in the morning didn’t help. First impressions of Fiji were, a.) it was muggy and b.) everything moved on ‘Fiji time’! Just when you wanted a swift checkin and to get some sleep, you’re greeted by a reception guy who couldn’t have been any more laid back without being in a coma. After what seemed an age we got into our room and crashed for the night. The downside of the delay is that not only do you lose dinner and sleep but the following morning was also written off with a well deserved lay in! What started off as a lay turned into a full on lazy day, spent wandering around the Hostel enjoying beers by the pool and beach and a quick trip to the supermarket for some supplies. Our only task of any real importance was booking some trips which we did through bookme.nz – a discount site offering about 40% off the brochure prices for all the activities on the islands. We found two of interest, a day sailing trip to a ‘desert island’ and a cannibal cave adventure. Our day ‘chilling out’ around the Hostel also helped us realise that the Bamboo Backpackers is a bit of a gem, good location, decent rooms for the price but also a great bar, good food and a brilliant atmosphere – given this would be our longest stop of the trip so far, we were pretty chuffed to be settling in. After a relaxed evening of with plenty of the local Fiji Gold beer and some pizzas we decided on an early night as our taxi for the Schooner would be picking us up around 9am…we hoped, although our emails asking for confirmation of pickup time had gone unanswered. The following morning we awoke ahead of schedule to discover an email saying the driver was outside and had been waiting 30 minutes – which sparked a mad rush to throw together our stuff and jump into the taxi to Denaru Marina. 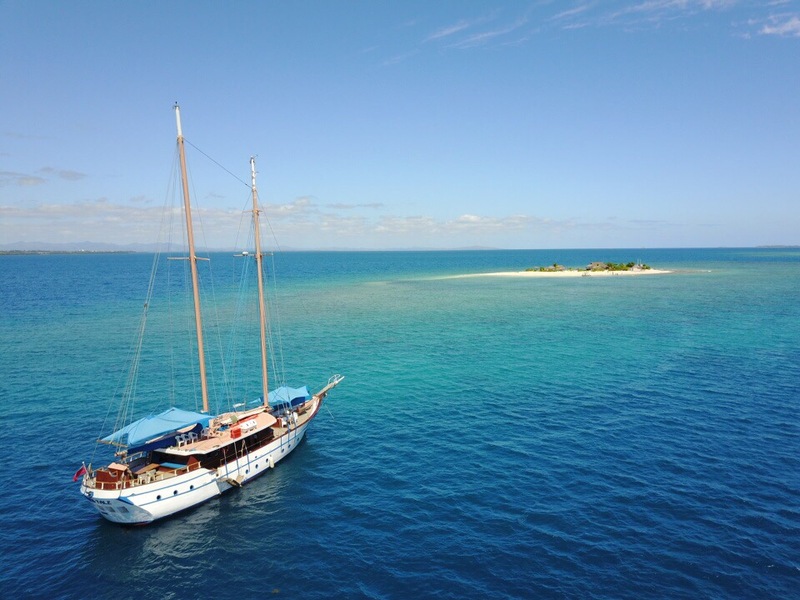 It was soon apparent that unlike our cosy little beach Hostel, most of Fiji catered for high end tourists, the Marina being packed with dozens and dozens of day boat excursions – all with queues of guests arriving from the Intercontinental and Sheraton. We hurried to our schooner, The Whales Tale, to grab a seat, some breakfast and the first of countless free mimosas before the crowds arrived. Once the last stragglers, including annoyingly m a family with baby and push chair, had loaded onto the boat we set sail for our island. With almost perfect blue skies and almost no swell, we had plain sailing out of the harbour and onto the ocean. En route we passed several of the larger Yassawa Islands before arriving at our little stretch of paradise for our day long stay. The crew ferried us to shore in a tender, landing us on a beach surrounded by crystal clear waters. On land we enjoyed more free beers and Kava, the local Fiji drink as part of a traditional welcome ceremony. While Jamie and Mike W opted for a day in the water snorkelling and then extreme snorkelling with a power jet engine – Mike opted for more drone flying and a walk around the island. The drone captured some spectacular shots of the island and surrounding coral reefs. After a feast of a lunch which included beef, chicken and salad, Jamie and MW went out for their power snorkel which an extra $80 Fijian dollars per person for an hour using a James Bond style underwater torpedo. They also hired an underwater camera to get some shots as the bombed around – although sadly they only worked out that there was three speed setting right at the end. After they’d finished in the water it was time to wrap, get back to the boat and enjoy an hour long sail home, accompanied by the crew singing songs and plenty of free beer. Back on dry land there was just enough time for some food before bed – tomorrow it was time for another beach.